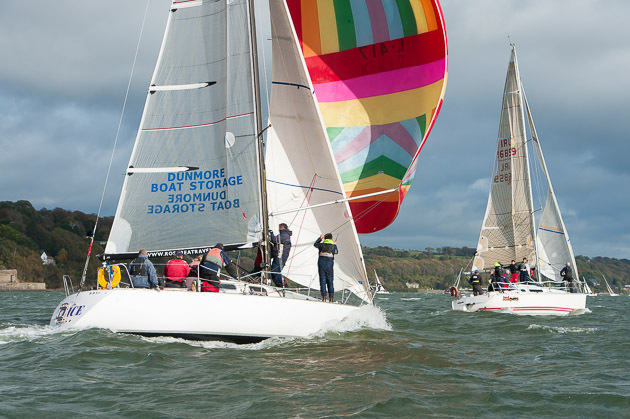 To day was the penultimate day of the Royal Cork CH Marine Autumn Series and such were the conditions a decision was taken to cancel Whitesail 1, 2 and Class 4. 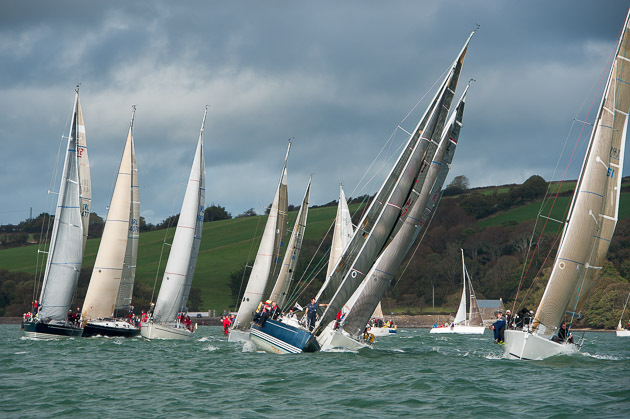 However, the 1720s had a fantastic day and as the 1720 Race Officer, Anthony O’Leary commented, they got good value for money as they got in three races and they were competitive right throughout the fleet. 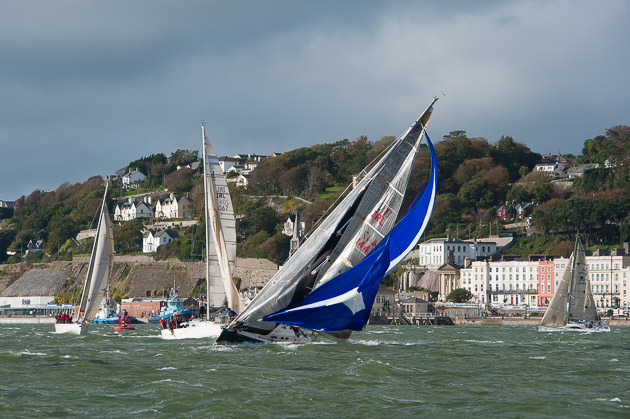 Sailing with smaller jibs and threequarter spinnakers they sailed windward/leeward courses and many a ‘Yahoo’ was heard as they went downwind at high speed. 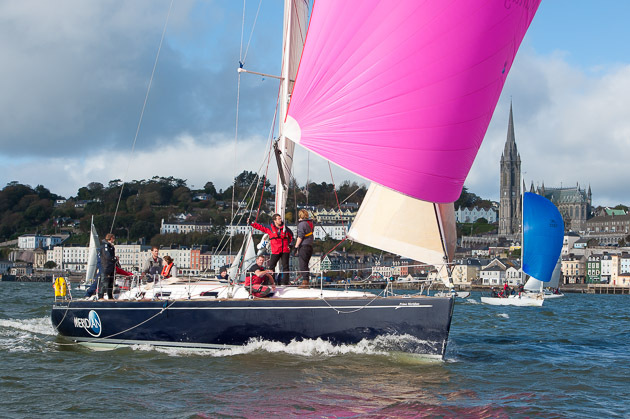 At the top end of the fleet Nicholas O’Leary, four times in a row winner of the Irish Helmsman’s Championship, and sailing T Bone, had keen competition from David Kenefick sailing Wet & Ready and just back from two years sailing the Figaro circuit. At the end of the day T Bone is top of the leaderboard for the class and the final day of racing next Saturday will be interesting to watch. Meanwhile, further in the harbour RO Peter Crowley for Classes 1, 2 and Three set up Sparetime using No. 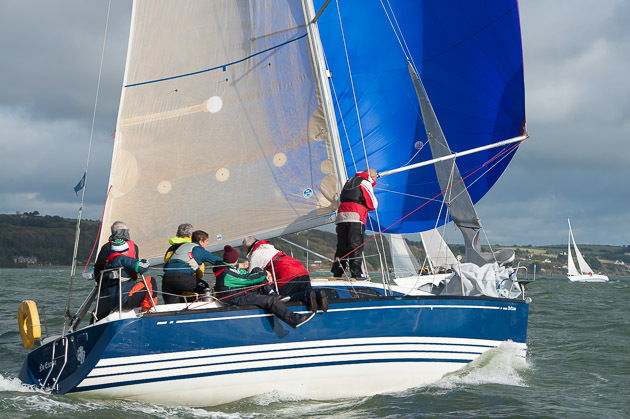 13 as the Pin End and sent Classes 1 and 2 on a windward/leeward course up to Whitepoint and on their way they passed the original home of the Royal Cork Yacht Club at Haulbowline where the club was founded in 1720. 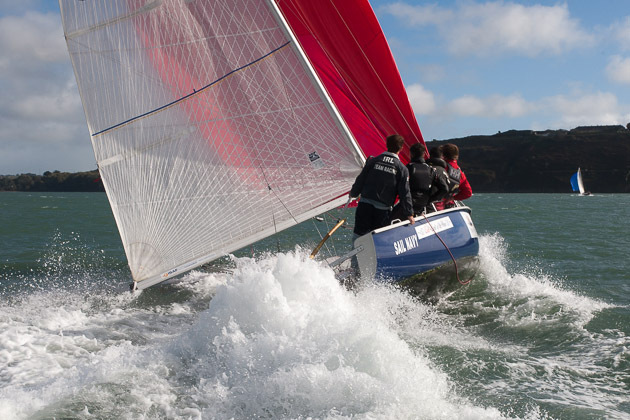 Class Three were sent on a shorter windward/leeward course to No. 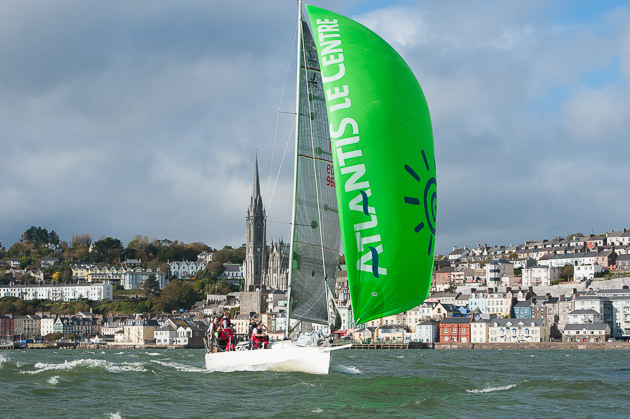 20 off Cobh. For their second race things got more interesting . They went on a beat to No. 20 again but this time they had a run to No. 11 then to No. 10, back to No. 11 and finished at the Cage. Classes 1 and 2 for their second race also went to No. 20, a run to No. 11 on to 10, back to 11, back to 10, back to 11 and finished at the Cage. 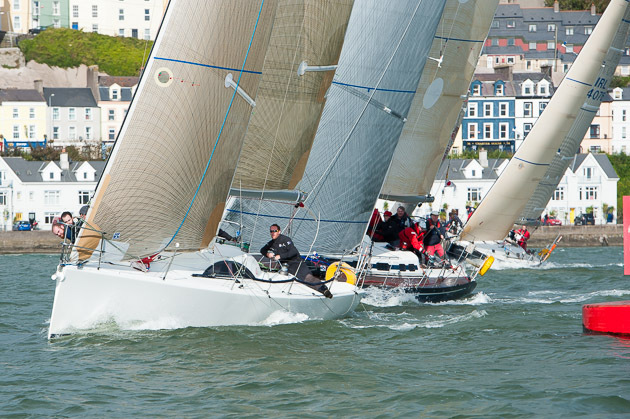 This proved to be quite a challenging race for the crews. 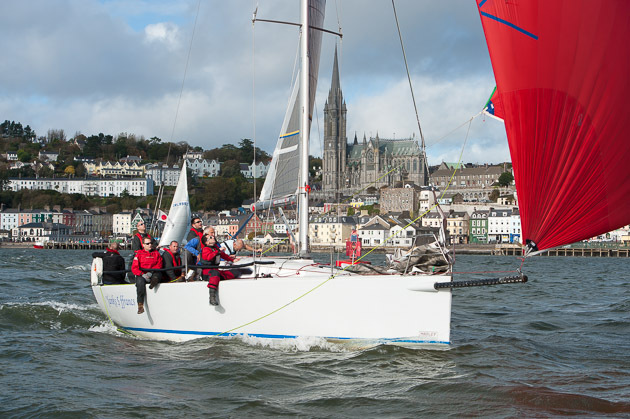 Also in the harbour today, and having an absolute ball in the conditions, were the hardy youngsters competing in their October ‘Cobbler’ League and here again it should be remembered that CH Marine were the sponsors of the Optimist National Championships at the Royal Cork this year. 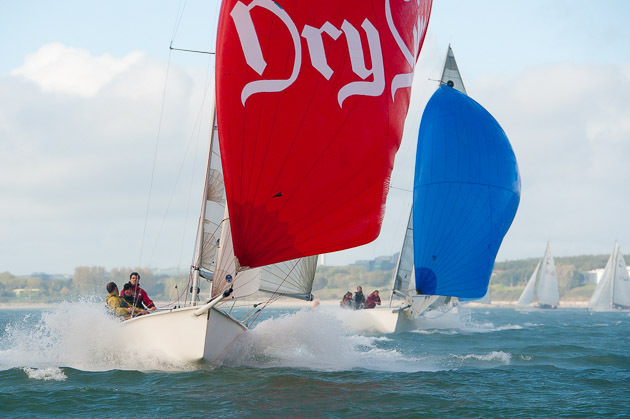 The final race of the series will be held next Saturday with the prize giving dinner taking place that evening. 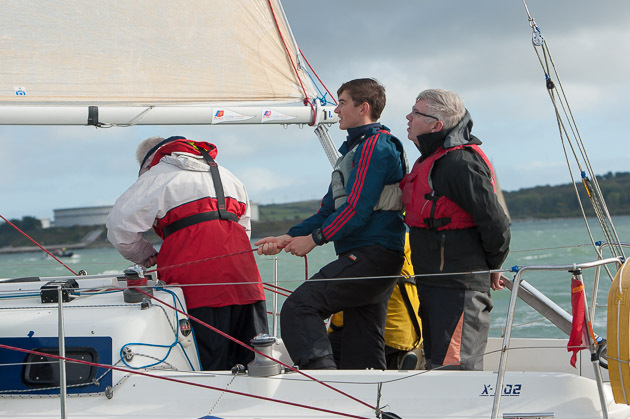 Royal Cork Navigation Courses begin next week.